Jams and jellies are spreads typically made from fruit, sugar, and pectin. Jelly is made with the juice of the fruit; jam uses the meat of the fruit as well. Some vegetable jellies are also produced. Preserving foods was a home-based operation until the nineteenth century. Even today, millions of people make fruit preserves in their own kitchens. Whether in the home kitchen or in a modern food processing plants, the procedure is essentially the same. Fruits are chopped and cooked with sugar and pectin until a gel is formed. The jam or jelly is then packed into sterilized jars. Spoilage prevention is a major concern for both the home and the commercial jam producer. An important innovation in food preservation occurred in 1810. Nicolas Appert, a French confectioner, determined that by filling jars to the brim with food so that all air is expressed out and then placing the jars in boiling water would prevent spoilage. In the early 1800s in the United States, the country was experiencing a surge westward. Of the many legendary characters to emerge during this period was John Chapman, better known as Johnny Appleseed. A nursery-man from western Pennsylvania, Chapman walked through the Midwest planting apple orchards. His purpose was to provide crops for the coming pioneers. One of those pioneers was Jerome Smucker of Ohio who used Chapman's apples to open a cider mill in 1897. Within a few years, he was also making apple butter. Smucker blended the apple butter in a copper kettle over a wood stove. He and his wife ladled the apple butter into stoneware crocks. She then sold it to other housewives near their home in Wayne County, Ohio. Fifty years earlier in Concord, Massachusetts, Ephraim Wales Bull finally achieved his goal of cultivating the perfect grape. His rich-tasting Concord grape became enormously popular. In 1869, Dr. Thomas Branwell Welch used the Concord grape to launch his grape juice company. When, in 1918, Welch's company made its first jam product, Grapelade, the United States Army bought the entire inventory. The company's trademark Concord grape jelly debuted in 1923. After World War II, food scientists developed the process of aseptic canning: heating the food and the jar or can separately. For sensitive foods such as fruits, this allowed for high-temperature flash cooking that preserved taste and nutritional value. When sugar prices soared in the early 1970s, high fructose corn syrup (HFCS) became a popular substitute. Several major food processing companies, including Archer Daniels Midland, Amstar CPC International, Cargill, H.J. Heinz, and Anheuser Busch opened HCFS plants. Jams and jellies are made from a variety of fruits, either singly or in combination. Most of the fruits are harvested in the fall. The level of ripeness varies. Pears, peaches, apricots, strawberries, and raspberries gel best if picked slightly underripe. Plums and cherries are best if picked when just ripe. The fruit is purchased from farmers. Most jam and jelly producers develop close relationships with their growers in order to ensure quality. The production plants are built close to the fruit farms so that the time elapsed between harvest and preparation is between 12-24 hours. The element that allows fruit to gel, pectin is present in varying degrees in all fruit. Apples, blackberries, cherries, citrus fruits, grapes, quinces, and cranberries have the best natural gelling properties. Strawberries and apricots are low in pectin. Jams made from such fruits are either blended with fruits high in pectin, or extra sugar is added to the mixture. Sometimes pectin is extracted industrially from dried apples. Citric acid is added to obtain the correct balance needed to produce the jam or jelly. Lime and lemon juice are high in citric acid, therefore they are the most prevalent source used. Citric acid can also be obtained by the fermentation of sugars. It is purchased from outside suppliers. Other flavorings, such as vanilla, cinnamon, mint, alcoholic beverages such as rum or Kirsch, can be added to the jam or jelly. These flavorings are purchased from outside suppliers. The ingredients must be added in carefully measured amounts. Ideally, they should be combined in the following manner: 1% pectin, 65% sugar, and an acid concentration of pH 3.1. Too much pectin will make the spread too hard, too much sugar will make it too sticky. 1 When the fruit arrives at the plant, it is inspected for quality, using color, ripeness, and taste as guides. Fruit that passes inspection is loaded into a funnel-shaped hopper that carries the fruit into pipes for cleaning and crushing. 2 As the fruit travels through the pipes, a gentle water spray clears away surface dirt. Depending on whether the finished product is to be jam or jelly, paddles push the fruit and or just its juice through small holes, leaving stems and any other excess debris behind. Some fruits, such as citrus and apples may be manually peeled, cored, sliced and diced. Cherries may be soaked and then pitted before being crushed. 3 The fruit and/or juice continues through another set of pipes to cooking vats. Here, it is heated to just below the boiling point (212° F [100° C]) and then immediately chilled to just below freezing (32° F [0° C]). This process, pasteurization, prevents spoilage. For jelly, the pulp is forced through another set of small openings that holds back seeds and skin. It will often then be passed through a dejuicer or filter. The juice or fruit is transferred to large refrigerated tanks and then pumped to cooking kettles as needed. 5 Premeasured amounts of fruit and/or juice, sugar, and pectin are blended in industrial cooking kettles. The mixtures are usually cooked and cooled three times. If additional flavorings are to be included, they are added at this point. When the mixture reaches the predetermined thickness and sweetness, it is pumped to filling machines. 6 Presterilized jars move along a conveyer belt as spouts positioned above pour premeasured amounts of jam or jelly into them. When the fruit arrives at the plant, it is inspected for quality, using color, ripeness, and taste as guides. Fruit that passes inspection is cleaned, crushed, and pasteurized. Next, the premeasured mixture is cooked with added sugar and pectin until it reaches the appropriate thickness and taste. Then it is vacuum-packed in jars and labeled. Metal caps are then vacuumed sealed on top. The process of filling the jars and vacuum packing them forces all of the air out of the jars further insuring the sterility of the product. 7 The sealed jars are conveyed to a machine that affix preprinted labels. According to law, these labels must list truthful and specific information about the contents. The jars are then packed into cartons for shipment. Depending on the size of the producer's operation, labeling and packaging is either achieved mechanically or manually. In the United States, food processing regulations require than jams and jellies are made with 45 parts fruit or juice to 55 parts sugar. The federal Food and Drug Administration (FDA) mandates that all heat-processed canned foods must be free of live microorganisms. Therefore, processing plants keep detailed lists of cooking times and temperatures, which are checked periodically by the FDA. Requirements also exist for the cleanliness of the workplace and workers. Producers install numerous quality control checks at all points in the preparation process, testing for taste, color and consistency. 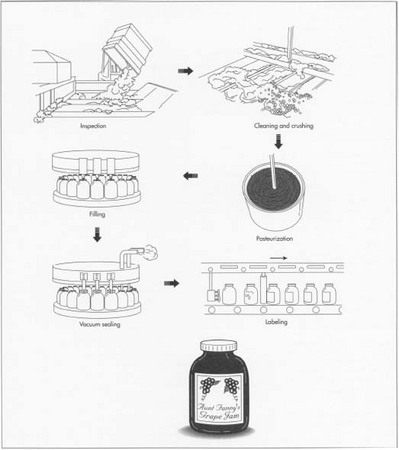 Because it is a relatively simple process, the production of jams and jellies is not expected to change dramatically. What is apparent is that new flavors will be introduced. Certain vegetable jellies such as pepper and tomato have been marketed successfully. Other, more exotic types including garlic jelly are also appearing on grocery shelves. Lang, Jenifer Harvey, ed. Larousse Gastronomique. New York: Crown, reprinted 1998. Trager, James. The Food Chronology. New York: Henry Holt, 1995. Anusasananan, Linda Lau. "Why?" Sunset (June 1996): 142. Kawatski, Deanna. "Canning: a modest miracle." Mother Earth News (August-September 1996): 52. J.M. Smucker Co. 1999. http:/www.smucker.com/ (June 28, 1999). Welch's Co. http://www.welchs.com/ (June 28, 1999). hi i need some information about strawberry jam and the proccesing line.